Over the last few years I’ve posted to this blog a few excerpts* of a book I’ve been working on for many years. I am pleased to announce that the book has now been published and is available for purchase. 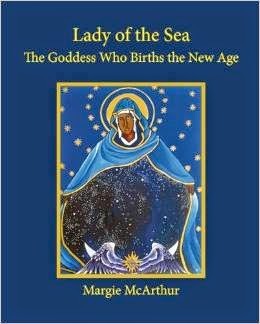 "Lady of the Sea" is a book about the Divine Mother — her place in the religious history of the western world, our relationship to her through the centuries, and her re-emergence and return to us in this era, as evidenced by dreams, visions, prophecies, and earth changes. As we move through the threshold of the Age of Pisces and into the Age of Aquarius, the Lady of the Sea — “the woman clothed in the sun, crowned with stars, and with the moon under her feet" — calls to us to recognize her presence and importance in our lives and in our world; she offers hope, healing, and balance as we seek to meet the challenges that confront us in this turbulent time of change. Signed copies may be obtained by ordering the book through my website. My shipment of books has not yet arrived, so please note that it will be a few weeks before I can ship your order. Also, please be aware that as of now, the book is available only through Amazon, CreateSpace, and my website. Any other sellers who are listing it on Amazon or elsewhere do not possess copies.